ESL (English Second Language) tutoring is currently a booming work from home industry. And contrary to popular belief, you don’t necessarily need to know a foreign language in order to teach — you just need to speak English fluently. In the ESL tutoring industry, you will most likely make the best money by starting your own freelance business. But as we all know, it can take a while for a home business to start making money because you have to put a lot of energy into getting clients and establishing yourself. If you want to work from home teaching English now, there are a lot of companies that may hire you. While you won’t make as much working for someone else as you might if you had your own business, you can still gain valuable experience in the industry while also getting some bills paid. ESL stands for English as a second Language. It is the study of English by non-native speakers in a country where English is the main language used for communication. People around the globe are learning English as their second language through online platforms like Skype or video classes. You can nail these jobs easily. Many professionals will be pleased to know that around 1 billion people all over the world are looking to learn English. For a good teacher, this can only represent unlimited job opportunities, and yes, you guessed it right….more money in your pocket. By the time you are done with this article, we guarantee you that you will come across a reliable website that will surely lead you that online English teaching job that suites your needs. Keep in mind that some ESL tutoring companies do not require a degree or any TESOL (Teaching English to Speakers of Other Languages) or TEFL (Teaching English as a Foreign Language) certification while others do. TEFL stands for Teaching English as a Foreign Language. This is one of the most reputable and widely accepted English teaching job boards. This antonym is mostly used by folks from the United Kingdom. In the US, Australia and Canada, the preferred acronym is TESOL; it means Teaching English to Speakers of Other Languages. The opportunities that this website brings to the table are limitless and if you can master it, then you can go as far as making a career out of it. TEFL mainly offers positions that involve traveling to different parts of the world teaching and studying while exploring new adventures. For the online folks, you will be pleased to hear that the website offers a lot of teaching jobs that you can handle from your computer. This ESL teaching job board offers a platform where teachers can transact with students from all parts of the globe. I bet you are wondering why the site has some guy’s name on it, well; it is because the site was launched by Dave Sperling back in 1995. A visit to this website can only be compared to putting a kid in a candy store; there is a lot to choose from, including: job postings, books, lesson-planning materials, idioms, discussion groups, quizzes, slang and many other resources. You do not have to be a rocket scientist to note that Dave’s ESL Café is by far one of the most popular web resources in the market, going by the millions of hits the site attracts on a monthly basis. Teachers looking for ESL jobs can go to the International Job Board, China Job Board and Korean Job Board sections. In as much as this is a great site and it offers online jobs, you cannot access an “online-only” category. A good teacher does not mind adding some helpful teaching tips, so we recommend that you check out the “ideas” page. This website is based around the idea of uploading your resume so that you are exposed to the people you are looking for. ESL Jobs World was established in 2007 by David Rogers-an experienced ESL teacher. Both the employer and the teacher can post on the website. The employer posts a job and as a result he or she gets access to the site’s Resume Database. This allows him or her to reach out to thousands of teachers that suit his or her needs. On the other hand, a teacher can upload a copy of his or her resume so that employers become aware of the teacher’s availability. Teachers have the privilege of choosing either online jobs or location-based jobs from all over the world for those with an adventurous heart. In order to nail the job that best suits your skills and interests, we recommend that you customize your resume so that it reflects the exact position you are looking for. If you are looking for a straight-forward site to apply for that ESL Job, then this is definitely the site for you. TESOL International Association is the largest professional organization for ESL teachers. TESOL stands for Teachers of English to Speakers of Other Languages. This community aims at advancing ESL teaching for non-native speakers all across the globe- it is composed of educators, students, administrators and researchers. The Virginia-based organization was established in 1966. You can find online ESL teaching jobs on this site although most of the jobs posted are usually location-based. WizIQ is one of the world’s largest online platforms that unite teachers and students. Teachers can create public classes that several students can join. Students on this site are highly motivated and hence they love learning from live instructors. This web-conferencing site is designed to cater for this need; instructors can create virtual classrooms using audio-video communication and other collaboration tools. This is a sure way of interacting with students in real time. The website’s award-winning Virtual Classroom solution has received approval from education service providers from around the globe. 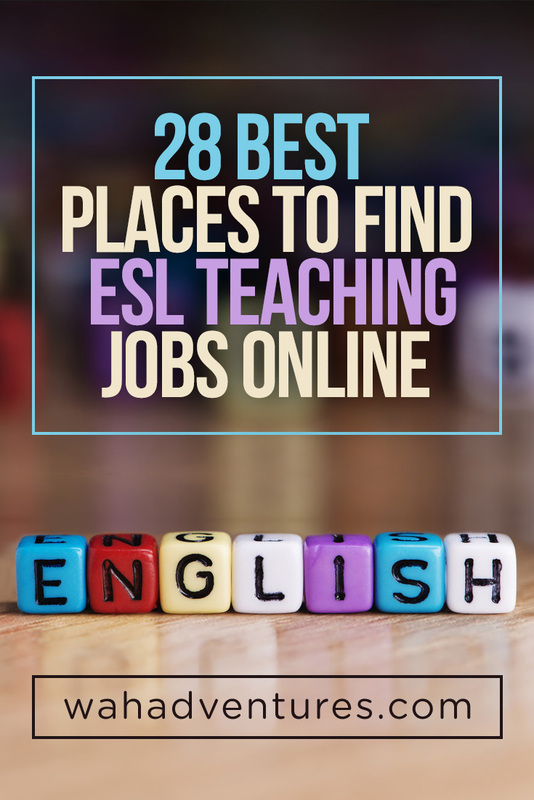 ESL Jobs is another great site that offers teachers with a variety of opportunities since it is updated with new jobs on a daily basis. The job board has some occasional online jobs but the majority of the jobs offered are location-based. Teachers are looking for jobs in this website find it easy to operate since it has an “Online only” section that has all the online jobs. Do you want to know what’s even cooler? The website has a feature that allows you come up with automatic alerts that inform you about prospective jobs. This is a French company that employs teachers for home based ESL tutoring. Some of the languages taught on the site include: Portuguese, English, Chinese, Korean Japanese and Italian. You are expected to work on Monday through Saturday, clocking a minimum of 5 hours per day. This can be a good place to nail a hustle-free job since the site is always on the lookout for native English Tutors to teach Business English to students via the phone. To score a job with GoFluent, then you must meet the conditions below. A PC with Windows XP or higher or MAC with 10.5 or higher. If you are conversant with a second language, then you stand a better chance of working for this site and this job might just be waiting for you! This is one of the easiest job boards to work with for teachers who are looking for ESL and TEFL jobs. All you have to do is sign up to Teachlingo to get full access to online and location-based jobs. When creating your account, it is important that you personalize it so that employers can search for you based on your preferences. The following steps will increase your chances of nailing that ESL job: set up your profile, upload your resume and create an introduction video. Well, it doesn’t get any easier than this because the jobs come to you, yes, you heard that right! The above steps mean recruiters can send you job offers that are customized for you directly into your dashboard. Alternatively, you can also use different filters to search for jobs yourself. When you find a job that suits you, click ‘Apply’ and add a short message. This will be sent to the recruiter’s inbox along with your resume and profile. Oh, it only gets better. If you want to be at the top of the food chain, you can promote your profile so that you always appear at the top of the results page when recruiters search for ESL teachers! This one of the best websites any teacher would dream of working for. If you are interested in working on this site, you should create an appealing profile that describes your qualifications, availability, experience, skills and of course, your price. Going by the feedback received, VerbalPlanet is a paradise for any teacher. What’s even better is that the opportunities in this site are limitless since you are exposed to plenty of students daily. The site offers room for you to grow your profile since students can always leave you positive reviews if they are impressed by your work. You can also keep your students since they can re-book you. VerbalPlanet sends you reminders and booking confirmations 24 hours before the lesson a student has booked with you. This website offers ESl teaching jobs through both online and location-based platforms. You do not have to go through tons of random jobs since the website has a section dedicated to online English teaching jobs. English teachers can explore the different jobs and career opportunities this website has to offer since it is updated regularly. Online ESL schools are also a reliable and trustworthy source of ESL jobs for ESL teachers. Below are some of the best online schools you should definitely check out. This online school uses Skype and virtual classes to teach English, Spanish, German and French. The languages are taught in private and group classes. Why should I consider Lingoda? For starters, this school offers the teacher flexible working hours and jobs are always available 24/7. You do not have to work for a set number of hours like other schools. This means that Lingoda can easily fit into your schedule and it can even be a part-time job since you can determine when and how long you want to work. As a teacher on this online language school, you can make €8.50 per hour. English First (EF) is one of the biggest online schools; it offers E-learning for adults. Students are taught as individuals or as a group. If you meet the conditions below, then you are ready to start teaching in this online language school. You must be a university graduate or be in be in your last year at the university. You must have access to a desktop or laptop. You must at least hold a 40-hour TEFL certificate or equivalent ESL certification. Have access to a reliable, high-speed internet connection. You should have the ability to work at least 15 hours per week. You stand a greater chance of nailing a teaching job on this site if you can speak Spanish, Portuguese or Russian and even better if you have teaching experience. This is a reputable Education Technology company that hires native English speaking teachers to teach English to the Latin American and U.S. Hispanic markets. In 2011, the website won the International E-Learning Award, Academic Division. The Miami-based company was established back in 2007 with the aim of revolutionizing online ESL teaching. The site is customized to meet the demands of busy working professionals. Open English offers its online English classes to more than 500,000 students mainly in Latin America. The company also targets the Spanish-speaking community based in the United States. The platform offers live classes 24 hours a day, 7 days a week. As a teacher, you will have the privilege of having a flexible schedule and hence you can determine when and how much work you want to do at a particular time. Open English has quite the reputation going by the features it has received on CNN en Español, NBC, Wall Street Journal as well as many Latin American media channels. To apply for a job, check the website’s application form. To nail a job on BuddySchool, you should come up with an impressive teacher profile that makes you stand out from the crowd. A good profile should describe your qualifications, experience and skills. This is what will bring students running to you for your services. Do not forget to state your availability. When working on this site, you have to be on your “A” game because there is a lot of competition. Work towards teaching more students so that your account can receive a higher score. Would you like to hear the best part? BuddySchool allows you to create a paid ad! Learnlight is a website that deals with online language training. The site caters for thousands of students that are spread out in more than 100 countries around the globe. Below are conditions one must fulfill to become a Learnlight ESL teacher. You must have a foreign language teaching certification, such as TESOL, TEFL, ELE and CELTA. You must have taught English for not less than two years. Be able to work with a fixed schedule for at least one year. Be available to work at least 10 hours every week. You stand in a better position of nailing the job if you are at an advanced level in a second language and if you have previously done business. This online school employs teachers to teach English as a second language via video classes and live classes. At least a two-year degree from a recognized institution. For video programs, you will also need to add a teaching certification. Many teachers will be pleased to hear that no previous teaching experience or teaching certificate is required if you choose live phone classes. As a teacher you are expected to work on Monday through Friday and so you will always be free on the weekends. Classes are only 10 to 20 minutes each. However, the working hours can be extremely early or very late in the night. In addition to this, you must have access to extremely fast internet speeds. Teachers on the site also have the privilege of setting their own hours. This education company was established by John T. Waldron back in 2005. Language Development Systems aims to use the internet to teach conversational English to international students. Language Development Systems offers online English language classes to cater for the needs of Chinese and South Korean students. The education company is licensed with the State of Michigan. If you meet the requirements below, then you are one step closer to landing a teaching job with Language Development Systems. You must be an English grammar expert. You must have basic computer skills like handling MS Office and Internet Explorer. Although not required, an English degree or teaching degree as well prior teaching experience can improve your chances of scoring a job with this site. According to some teachers who have worked on the site, the job is quite rewarding and fun. So go ahead and try it, after all, you will get to learn Korean and Chinese culture! This is one of the most reputable online education companies; it connects native teachers to non-native students. The lessons are conducted using live video streaming. As a teacher on this website, you will have the privilege of using ready-to-teach ESL lesson plans available from the site’s structured courses. Later, students can practice their English using exercises and games after going through the online lessons. Your responsibility as a teacher is to follow the students’ progress and then taking corrective actions. Each class takes an hour. Teachers are paid hourly. The more experienced you are, the more money you earn. Live classes have two students. Englishkey offers room for growth and you can even turn that part-time job into a career. Experienced teachers can land higher roles like training new instructors and mentoring students. And you guessed it right; this definitely means more money for you. Berlitz is a big website that offers children programs and a diversity of personalized language classes. The languages taught are English and French. As an ESL teacher you will earn around $13 an hour. You do not have to have prior teaching experience but it is an added advantage. This is an educational technology website that offers one-on-one online language lessons. Some of the languages taught on the site include Spanish, Chinese and French. The company has 2 million users. If you are interested in joining Italki, then you will be among the more than 3000 teachers hired to teach in over 100 languages. Italki was established by Yongyue Jiang and Kevin Chen and in 2007. This online marketplace is registered in Hong Kong and it has a development office in Shanghai, China. As a teacher, expect feedback and ratings from the site’s students after finishing classes. Remember, most lessons on Italki are done on Skype. Oh, you will be paid in credits which you can change to cash. You will also have to part with a 15% service fee for successful lesson transactions. This is one of the easiest ways to make money while teaching ESL because it is quite passive, and let’s be real; we all love some easy money. After creating an account, the site will do everything for you, including: scheduling, marketing, payment and managing your students. All you have to do is wait for students to book online lessons with you! iTutorGroup is a global leader in online education; the website aims at providing personalized learning experiences. The site provides real-time interactive language training. The website was established in 2004 by Eric Yang and Ming Yang. It has more than 5,000 teaching consultants in 60 nations all around the globe. A good webcam and headset. If you meet the following requirements, then you are ready to get cracking. Hold a university degree or have ESL teaching experience. Have a laptop or desktop PC. Be able to speak slowly and clearly. You must be available to commit to a weekly work schedule. Have a quiet place to work from. Be able to use Internet Explorer. iTutorGroup offers flexibility since you can set your own hours. This is one for the non-experienced ESL tutor. The only requirement Cambly has for applying is that you speak fluent English. Tutoring sessions are done via webcam and are very casual. You’re only asked to speak conversationally with your students for a short period of time. Cambly pays .17 cents per minute of tutoring time. Payments are made via Paypal twice monthly as long as you have earned at least $20. Tutor ABC is one of the more well-known ESL tutoring companies. They require that you have TESOL/TEFL certification. If you don’t have one of these qualifications, you must be willing to obtain it during your probation period with their company. They also require that you have either a degree or prior experience teaching ESL. Tutors earn roughly $8.50 per tutoring session (these must last at least 45 minutes) and payments are made via Paypal once a month. Sessions are conducted via webcam. If you work for ISUS, your ESL lessons will be done via phone/Voip. You must be a native English speaker with some prior ESL or other similar experience. ISUS is open to applicants worldwide and the pay is rumored to be between $12 and $15 hourly. Indeed is a worldwide Job search engine that is based in America. This website was founded by Rony Kahan and Paul Forster back in 2004. Indeed collects job listings outsourced from thousands of websites like staffing firms, company career pages, job boards and associations. Apart from uploading your resume, you can apply for a job directly through the site. Indeed can be accessed in over 50 countries and it serves more than 100 million job seekers each month. You can check out the job listings on the site and concentrate on the section that deals with online ESL teaching jobs. The site allows you to use filters like job type to get the job that suits your needs. This is an American-based international freelance website where clients offer jobs to independent professionals. Most of the tasks completed by freelancers include writing, designing among others. Upwork can also be a good hunting ground for teachers looking for ESL jobs because the site has a whole section dedicated to these kinds of jobs. The site boasts of being the biggest freelancer marketplace going by the three million jobs posted each year; the jobs are worth $1 billion USD. Your pay is either hourly or fixed. The contractors have the privilege of interviewing freelancers. If the client likes your work, then you are good to start on that ESL job. There are always new jobs on Upwork and therefore the site offers any job seeker a good shot at his or her ideal job. Apart from buying and selling stuff, this site also has teaching jobs. In fact, your ideal ESL job might just be waiting for you on Craiglist. Almost anything can sell on this site and so it should not come as a surprise that employers can also post ESL jobs here, especially considering that Craiglist attracts a lot of traffic. When job hunting on this site, concentrate on the countries and cities that have a significant demand for learning the English language. Some of the countries and cities you should check out include: Buenos Aires, Rio De Janeiro, Colombia, Mexico City, Singapore, Caracas, Shanghai, Seoul, Tokyo, São Paulo and Copenhagen. There are numerous jobs on this site and therefore the above process is worth your time. Flexjobs is a legitimate professional job site that lists flexible schedule jobs, part-time jobs, freelance jobs and professional telecommuting jobs. This website has been featured on NBC and CNN. Flexjobs can be a good place to scratch when you are looking for that online ESL job. Be sure to check the updates on the website’s ‘Online ESL teaching jobs’ section and it just might be your lucky day. We have previously done a review on Flexjobs, so be sure to check it out. The ongoing digital revolution has significantly disrupted the traditional ways of doing things, including teaching. What this means is that more and more learners are looking for solutions to their problems online. This is good news for teachers since this demand means that there are unlimited opportunities for those who want to use the internet as a source of income. The online market for ESL Courses is booming as thousands of non-native students from around the world are discovering the benefits of Skype lessons. There has never been a better time than now to become an online ESL teacher. When starting off as an online ESL teacher, it is advisable that you start working for websites like the ones listed above. However, if you are looking to turn this opportunity into a long-term career, then having your own website is the way to go since you have control over your hours, the rate of pay, teaching style among other factors. As an online ESL teacher, the rewards are great. Apart from the satisfaction of seeing your students blossom, you also have an opportunity of interacting with attractive and successful people from all over the world, especially if you pick Business English classes. Picture this, learning about new cultures and getting paid in the process, and did I mention that you are still seated on your couch! How can it get better than that? Eleven of the BEST places to find Work at Home Job Openings! I’ve just started doing this and It’s working out great!! Very fun and easy job! Which site did you start using? Thanks! Good info. Looking to start doing this. Do they have a page in English? Sorry I just saw this message. They don’t, they have contracted recruiters that hire for them and the one I went through I’m not in touch with anymore. But tutorabc has been hiring and it’s very easy to apply through their website. Hello! I’ve just started teaching with TutorABC and it’s great. Very fun, easy, great pay, and great support staff! Teshauna, make sure you keep your students entertained and smile a lot while working with TutorABC. Don’t forget to critique the students or they get upset. I loved working with the company, but the time difference was confusing. Also, the teachers pretty much get the blame for everything. So if you reschedule a day, and the schedulers do not get it right – it’s your fault. Other than that, I loved the students. They were so respectful! Thinking about going back, but hesitating because of the issues I mentioned above. Have fun and good luck! to gain access to a whole lot of vastly experienced and high quality native english tutors who are readily available to take you through realtime english lessons at your own convenient time right from the comfort of your room. Hey, awesome article! I’m the creator of Teachlingo. Thanks for the great write-up! I am Alexis from Learntalk, a fast growing Education Technology (EdTech) company providing outsourced language tuition to individuals, corporates, institutions and other language schools around the World from its main office in Manila, Philippines. and we would like to ask if you would be able to review our website too. It would help us in promoting the company and should you be interested in teaching, might as well try to apply as a teacher too! 1. You can give as much or as little availability as you like. 2. You get paid at 2 week intervals. 3. Depending on your level you get paid up to $15 an hour if you have a CELTA certificate. 4. The hiring process is nearly completely automated and really simple. 5. The training process is also full of videos and the team is really helpful. 6. Learntalk accepts non-native teachers from all over the World. 1. Learntalk was founded in 2016 with the aim of making Language learning accessible to all. 2. It operates an on demand language video call platform. As a teacher you can be booked any time. 8. Curriculum is modular based on the Direct Method and Communicative Approach. Lesson plans developed by senior ex-Berlitz and Go Fluent teachers and influenced by partnership with the British Council. Feel free to let me know if you have any concern or question. Thank you and we are looking forward to hear from you soon!